The blended refrigerant R-134a is a long-term HFC alternative with similar properties to R-12. It has become the new industry-standard refrigerant for automotive air-conditioning and refrigerator/freezer appliances. R-12 applications have used alternatives other than 134a for lower temperatures. R-134a requires polyolester (POE) lubricants. Traditional mineral oils and alkyl benzenes do not mix with HFC refrigerants, and their use with 134a may cause operation problems or compressor failures. In addition, automotive A/C systems may use polyalkaline glycols (PAGs), which are typically not seen in stationary equipment. Both POEs and PAGs will absorb moisture and hold onto it to a much greater extent than traditional lubricants. The moisture will promote reactions in the lubricant as well as the usual problems associated with water corrosion and acid formation. The best way to dry a wet HFC system is to rely on the filter dryer. Deep vacuum will remove “free” water but not the water that has absorbed into the lubricant. 1. For centrifugal compressors it is recommended that the manufacturer’s engineering staff become involved in the project—special parts or procedures may be required. This will ensure proper capacity and reliable operation after the retrofit. 2. Most older direct expansion systems can be retrofitted to R-401A, R-409A, R-414B, or R-416A (R 500 to R-401B or R-409A), so long as there are no components that will cause fractionation within the system to occur. 3. Filter driers should be changed at the time of conversion. 4. The system should be properly labeled with refrigerant and lubricant type. 1. See Recommendation Table (this can be found on the National Refrigerants Web site—click on Technical Manual) for blends that work better in high ambient-heat conditions. 2. Review the properties of the new refrigerant you will use and compare them to R-12. Prepare for any adjustments to system components based on pressure difference or temperature glide. 3. Filter dryers should be changed at the time of conversion. 1. See Recommendation Table for blends that have better low-temperature capacity. 4. The system should be properly labeled with refrigerant and lubricant type. Another blended refrigerant that can be used to substitute for R-12 is 401A . It is a blend of R-22, 152a, and 124. The pressure and system capacity match R-12 when the blend is running an average evaporator temperature of 10 to 20 degrees F. Applications for this refrigerant are as a direct expansion refrigerate for R-12 in air-conditioning systems and in R-500 systems. One of the requirements of an ideal refrigerant is that it must be nontoxic. In reality, however, all gases (with the exception of pure air) are more or less toxic or asphyxiating. It is therefore important that wherever gases or highly volatile liquids are used, adequate ventilation be provided, because even nontoxic gases in air produce a suffocating effect. Vaporized refrigerants (especially ammonia and sulfur dioxide) bring about irritation and congestion of the lungs and bronchial organs, accompanied by violent coughing, vomiting, and, when breathed in sufficient quantity, suffocation. It is of the utmost importance, therefore, that the serviceman subjected to a refrigerant gas find access to fresh air at frequent intervals to clear his lungs. When engaged in the repair of ammonia and sulfur dioxide machines, approved gas masks and goggles should be used. Carrene, Freon (R-12), and carbon dioxide fumes are not irritating and can be inhaled in considerable concentrations for short periods without serious consequences. It should be remembered that liquid refrigerant would refrigerate or remove heat from anything it meets when released from a container. In the case of contact with refrigerant, the affected or injured area should be treated as if it has been frozen or frostbitten. Q. Does the ultra violet (UV) scanner light work better than an electronic leak detector? A. No one detection system is better for all situations. But, with a UV lamp you can scan a system more quickly and moving air is never a problem. Solutions also leave a telltale mark at every leak site. Multiple leaks are found more quickly. (See Figure A4.3). Q. How effective are new light emitting diode (LED) type UV lights? A. LEDs are small, compact lights for use in close range. Most effective at 6-in. range. The model with two blue UV and three UV bulbs has a slightly greater range. Higher power Yellow Jacket lights are available. Q. Can LED bulbs be replaced? A. No. The average life is 110,000 hours. Q Are RediBeam lamps as effective as the System II lamps? A. The RediBeam lamp has slightly less power to provide lightweight portability. But with the patented reflector and filter technologies, the RediBeam 100-W bulb produces sufficient UV light for pinpointing leaks. Q. Does the solution mix completely in the system? A. Solutions are combinations of compatible refrigeration oil and fluorescent material designed to mix completely with the oil type in the system. Q. How are solutions different? A. Solutions are available with mineral, alkylbenzene, PAG, or polyol ester base stock to match oil in the system. Q. What is universal solution? A. It is made from polyol ester and mixes well with newer oils. It also works in mineral oil systems, but can be harder to see. Q. What is the lowest operating temperature? A. It is -40 degrees F for all solutions. Alkylbenzene in alkylbenzene systems to -100 degrees F.
Q. Does solution stay in the system? A. Yes. When future leaks develop, just scan for the sources. In over six years of testing, the fluorescent color retained contrast. When the oil is changed in the system, scanner solution must be added to the new oil. Q. Is the solution safe? A. Solutions were tested for three years before introduction and have been performance proven in the field since 1989. Results have shown the solutions safe for technicians, the environment and all equipment when used as directed. Solutions are pure and do not contain lead, chromium, or chlorofluorocarbon (CFC) products. Presently, solutions are approved and used by major manufacturers of compressors, refrigerant, and equipment. Q. How do I determine oil type in a system? A. Many times the oil is known due to the type of refrigerant or equipment application. Systems should be marked with the kind of oil used. Always tag a system when oil type is changed. Q. In a system with a mix of mineral and alkylbenzene oil, which scanner solution should be used? A. Base your choice of solution on whatever oil is present in the larger quantity. If you do not know which oil is in greater quantity, assume it to be alkylbenzene. Q. How do I add solution to the system? A. In addition to adding solution using injectors or mist infuser, you have other possibilities. If you do not want to add more gas to the system, connect the injector between the high and low side allowing system pressure to do the job. Or, remove some oil from the system, then add solution to the oil and pump back in. Q. How is the solution different from visible colored dyes? A. Unlike colored dyes, Yellow Jacket fluorescent solutions mix completely with refrigerant and oil and do not settle out. Lubrication, cooling capacity, and unit life are not affected; and there is no threat to valves or plugging of filters. The solutions will also work in a system containing dytel. Q. How do I test the system? A. Put solution into a running system to be mixed with oil and carried throughout the system. Nitrogen charging for test purposes will not work since nitrogen will not carry the oil. To confirm solution in the system, shine the lamp into the system’s sight glass. Another way is to connect a hose and a sight glass between the high and low sides, and monitor flow with the lamp. The most common reason for inadequate fluorescence is insufficient solution in the system. Q. Can you tell me more about bulbs? A. 115-V systems are sold with self-ballasted bulbs in the 150-W range. Bulbs operate in the 365 nanometer long range UV area and produce the light necessary to activate the fluorescing material in the solution. A filter on the front of the lamp allows only “B” band rays to come through. “B” band rays are not harmful. Q. What is the most effective way to perform an acid test? A. Scanner solution affects the color of the oil slightly. Use a two-step acid-test kit which factors out the solution in the oil, giving a reliable result. Q. Can fluorescent product be used in nonrefrigerant applications? A. Yes, in many applications. 1. Inspect entire A/C system for signs of oil leakage, corrosion cracks, or other damage. Follow the system in a continuous path so no potential leaks are missed. 2. Make sure there is enough refrigerant in a system (about 15 percent of system capacity or 50 psi/min) to generate pressure to detect leaks. 3. Check all service access port fittings. Check seals in caps. 4. Move detector probe at 1 inch/s within inch of suspected leak area. 5. Refrigerant is heavier than air, so position probe below test point. 6. Minimize air movement in area to make it easier to pinpoint the leak. 7. Verify an apparent leak by blowing air into the suspected leak. 8. When checking for evaporator leaks, check for gas in condensate drain tube. 9. Use heated sensor type detector for difficult-to-detect R-134a, R-410A, R-407C, and R-404A. • Hand-held precision equipment detects all hydrocarbon and other combustible gases including propane, methane, butane, industrial solvents, and more. • Sensitivity, bar graph, and beeping to signal how much and how close. • Unit is preset at normal sensitivity, but you can switch to high or low. After warm-up you will hear a slow beeping. Frequency increases when a leak is detected until an alarm sounds when moving into high gas concentration. The illuminated bar graph indicates leak size. • If no leak is detected in an area you suspect, select high sensitivity. This will detect even low levels in the area to confirm your suspicions. Use low sensitivity as you move the tip over more defined areas, and you will be alerted when the tip encounters the concentration at the leak source. • Ultrasensitive sensor detects less than 5 ppm methane and better than 2 ppm for propane. It performs equally well on a complete list of detectable gases including acetylene, butane, and isobutane. • Long-life sensor easily replaced after full service life. Window air conditioners (air-cooled room conditioners) and through-the-wall room air conditioners with supplemental heating are designed to cool or heat individual room spaces. Window units are used where low initial cost, quick installation, and other operating or performance criteria outweigh the advantages of more sophisticated systems. Room units are also available in through-the wall sleeve mountings. Sleeve-installed units are popular in low cost apartments, motels, and homes. Ventilation can be through operable windows or limited outside air ventilation introduced through the self-contained room HVAC unit. Window units may be used as auxiliaries to a central heating or cooling system or to condition selected spaces when the central system is shut down. These units usually serve only part of the spaces conditioned by the basic system. Both the basic system and window units should be sized to cool the space adequately without the other operating. A through-the-wall air-cooled room air conditioner is designed to cool or heat individual room spaces. Design and manufacturing parameters vary widely. Specifications range from appliance grade through heavy duty commercial grade, the latter known as packaged terminal air conditioners (PTACs) or packaged terminal heat pumps (PTHPs) (ARI Standard 310/380). With proper maintenance, manufacturers project an equipment life of 10 to 15 years for these units. Air-cooled heat pumps located on roofs or adjacent to buildings are another type of package equipment with most of the features noted here, with the additional benefit of supply air distribution and equipment outside the occupied space. This improved ductwork arrangement makes equipment accessible for servicing out the occupied space, unlike in-room units. • Installation of in-room unit is simple. It usually only requires an opening in the wall or displacement of a window to mount the unit, and connection to electrical power. • Installation of outside heat pumps is simple with rigging onto concrete pad at grade level or on the roof. • Generally, the system is well-suited to spaces requiring many zones of individual temperature control. • Equipment life may be less than for large central equipment, typically10 to 15 years, and units are built to appliance standards, rather than building equipment standards. • Direct access to outside air is needed for condenser heat rejection; thus, these units cannot be used for interior rooms. • The wall box should drain to the outside, which may cause dripping on walls, balconies, or sidewalks. • Temperature control is usually two-position, which causes swings in room temperature. • Ventilation and economy cycle capabilities are fixed by equipment design. • Humidification, when required, must be provided by separate equipment. • Noise and vibration levels vary considerably and are not generally suitable for sound-critical applications. • Routine maintenance is required to maintain capacity. Condenser and cooling coils must be cleaned, and filters must be changed regularly. The water-side economizer is another option for reducing energy use. ASHRAE Standard 90.1 addresses its application, as do some state energy codes. The water-side economizer consists of a water coil in a self contained unit upstream of the direct-expansion cooling coil. All economizer control valves, piping between economizer coil and condenser, and economizer control wiring can be factory installed. The water-side economizer uses the low cooling tower or evaporative condenser water temperature to either (1) precool entering air, (2) assist mechanical cooling, or (3) provide total system cooling if the cooling water is cold enough. If the economizer is unable to maintain the air-handling unit’s supply air or zone set point, factory mounted controls integrate economizer and compressor operation to meet cooling requirements. For constant condenser water flow control using a economizer energy recovery coil and the unit condenser, two control valves are factory-wired for complementary control, with one valve driven open while the other is driven closed. This keeps water flow through the condenser relatively constant. In variableflow control, condenser water flow varies during unit operation. The valve in bypass/energy recovery loop is an on/off valve and is closed when the economizer is enabled. Water flow through the economizer coil is modulated by its automatic control valve, allowing variable cooling water flow as cooling load increases (valve opens) and reduced flow on a decrease in cooling demand. If the economizer is unable to satisfy the cooling requirements, factory-mounted controls integrate economizer and compressor operation. In this operating mode, the economizer valve is fully open. When the self-contained unit is not in cooling mode, both valves are closed. Reducing or eliminating cooling water flow reduces pumping energy. • Compressor energy is reduced by precooling entering air. Often, building load can be completely satisfied with an entering condenser water temperature of less than 55°F. 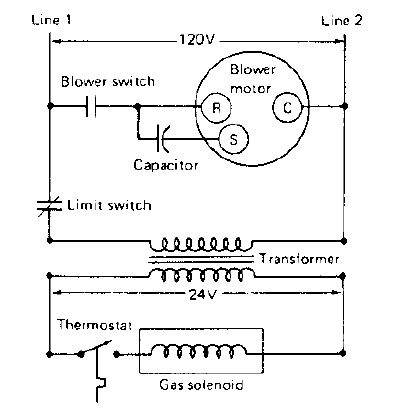 Because the wet-bulb temperature is always less than or equal to the dry-bulb temperature, a lower discharge air temperature is often available. • Building humidification does not affect indoor humidity by introducing outside air. • No external wall penetration is required for exhaust or outside air ducts. • Controls are less complex than for air-side economizers, because they are often inside the packaged unit. • More net usable floor area is available because large outside and relief air ducts are unnecessary. • Air-side pressure drop may increase with the constant added resistance of a economizer coil in the air stream. • The increased operation (including in winter) required of the cooling tower may reduce its life. With some decentralized systems, an air-side economizer is an option, if not an energy code requirement (check state code for criteria). The air-side economizer uses cool outside air to either assist mechanical cooling or, if the outside air is cool enough, provide total cooling. It requires a mixing box designed to allow 100% of the supply air to be drawn from outside. It can be a field-installed accessory that includes an outside air damper, relief damper, return air damper, filter, actuator, and linkage. Controls are usually a factory-installed option. Self-contained units usually do not include return air fans. A barometric relief, fan-powered relief fan, or return/exhaust fan may be provided as an air-side economizer. The relief fan is off and discharge/ exhaust dampers are closed when the air-side economizer is inactive. • Substantially reduces compressor, cooling tower, and condenser water pump energy requirements, generally saving more energy than a water-side economizer. • May improve indoor air quality by providing large amounts of outside air during mild weather. • In systems with larger return air static pressure requirements, return or exhaust fans are needed to properly exhaust building air and take in outside air. • If the unit’s leaving air temperature is also reset up during the airside economizer cycle, humidity control problems may occur and the fan may use more energy. • More and/or larger air intake louvers, ducts, or shafts may be required. Piping should deliver refrigerant, heating water, chilled water, condenser water, fuel oil, gas, steam, and condensate drainage and return to and from HVAC equipment as directly, quietly, and economically as possible. Structural features of the building generally require mechanical and electrical coordination to accommodate P-traps, pipe pitch-draining of low points in the system, and venting of high points. When assessing application of pipe distribution to air distribution, the floor-to-floor height requirement can influence the pipe system: it requires less ceiling space to install pipe. An alternative to horizontal piping is vertical pipe distribution, which may further reduce floor-to-floor height criteria. HVAC piping systems can be divided into two parts: (1) piping in the central plant equipment room and (2) piping required to deliver refrigerant, heating water, chilled water, condenser water, fuel oil, gas, steam, and condensate drainage and return to and from decentralized HVAC and process equipment throughout the building. In new construction and renovation projects, certain HVAC piping may or may not be insulated depending on code requirements. ASHRAE Standard 90.1 and Chapter 26 of the 2005 ASHRAE Handbook Fundamentals have information on insulation and calculation methods. WHAT ARE THE DIFFERENT OZONE DEPLETING REFRIGERANTS? However, they still contain ozonedestroying chlorine. The Montreal Protocol, as amended, is carried out in the U.S. through Title VI of the Clean Air Act. This act is implemented by the Environmental Protection Agency. An HCFC known as R-22 has been the refrigerant of choice for residential heat-pump and air-conditioning systems for more than four decades. Unfortunately for the environment, release of R-22 resulting from system leaks contributes to ozone depletion. In addition, the manufacture of R-22 results in a byproduct that contributes significantly to global warming. As the manufacture of R-22 is phased out over the coming years as part of the agreement to end production of HCFCs, manufacturers of residential air-conditioning systems are beginning to offer equipment that uses ozone-friendly refrigerants. Many homeowners may be misinformed about how much longer R-22 will be available to service their central A/C systems and heat pumps. The EPA document assists consumers in deciding what to consider when purchasing a new A/C system or heat pump or repairing an existing system. Under the terms of the Montreal Protocol, the U. S. agreed to meet certain obligations by specific dates. These will affect the residential heat-pump and air -conditioning industry. In accordance with the terms of the protocol, the amount of all HCFCs that can be produced nationwide was to be reduced by 35 percent by January 1, 2004. In order to achieve this goal, the U.S. ceased production of HCFC-141b, the most ozone-damaging of this class of chemicals, on January 1, 2003. This production ban should greatly reduce nationwide use of HCFCs as a group and make it likely that the 2004 deadline will have a minimal effect on R-22 supplies. After January 1, 2010, chemical manufacturers may still produce R-22 to service existing equipment but not for use in new equipment. As a result, heating, ventilation and air-conditioning (HVAC) manufacturers will only be able to use preexisting supplies of R-22 in the production of new air conditioners and heat pumps. These existing supplies will include R-22 recovered from existing equipment and recycled by licensed reclaimers. Use of existing refrigerant, including refrigerant that has been recovered and recycled, will be allowed beyond January 1, 2020 to service existing systems. However, chemical manufacturers will no longer be able to produce R-22 to service existing air conditioners and heat pumps. A Web site and both the regulations themselves and fact sheets are available from the EPA Stratospheric Ozone Hotline at 1-800-296-1996. The handling and recycling of refrigerants used in motor-vehicle air conditioning systems is governed under section 609 of the Clean Air Act. In the same year EPA published a final rule extending the required leak-repair practices and the associated reporting and record-keeping requirements to owners and/or operators of comfort-cooling, commercial- refrigeration, or industrial-process refrigeration appliances containing more than 50 pounds of a substitute refrigerant if the substitute contains a class I or class II ozone-depleting substance (ODS). In 2004 EPA finalized a rule sustaining the Clean Air Act prohibition against venting hydrofluorocarbon (HFC) and perfluorocarbon (PFC) refrigerants. This rule makes the knowing venting of HFC and PFC refrigerants during the maintenance, service, repair, and disposal of air-conditioning and refrigeration equipment (i.e., appliances) illegal under Section 608 of the Clean Air Act. The ruling also restricts the sale of HFC refrigerants that consist of an ozone-depleting substance (ODS) to EPA-certified technicians. However, HFC refrigerants and HFC refrigerant blends that do not consist of an ODS are not covered under “The Refrigerant Sales Restriction,” a brochure that documents the environmental and financial reasons to replace CFC chillers with new, energy-efficient equipment. Moisture should be kept out of refrigeration systems, since it can corrode parts of the system. Whenever low temperatures are produced, the water or moisture can freeze. If freezing of the metering device occurs, then refrigerant flow is restricted or cut off. The system will have a low efficiency or none at all. The degree of efficiency will depend upon the amount of icing or the part affected by the frozen moisture. All refrigerants will absorb water to some degree. Those that absorb very little water permit free water to collect and freeze at low-temperature points. Those that absorb a high amount of moisture will form corrosive acids and corrode the system. Some systems will allow water to be absorbed and frozen. This causes corrosion. Hydrolysis is the reaction of a material, such as Freon 12 or methyl chloride, with water. Acid materials are formed. The hydrolysis rate for the Freon compounds as a group is low compared with other halogenated compounds. Within the Freon group, however, there is considerable variation. Temperature, pressure, and the presence of other materials also greatly affect the rate. Typical hydrolysis rates for the Freon compounds and other halogenated compounds are given in Table below. Hydrolysis rate in water grams/litre of water/year. With water alone at atmospheric pressure, the rate is too low to be determined by the analytical method used. When catalyzed by the presence of steel, the hydrolysis rates are detectable but still quite low. At saturation pressures and a higher temperature, the rates are further increased. Under neutral or acidic conditions, the presence of hydrogen in the molecule has little effect on the hydrolytic stability. However, under alkaline conditions compounds containing hydrogen, such as Freon 22 and Freon 21, tend to be hydrolyzed more rapidly. Most of the commonly used construction metals, such as steel, cast iron, brass, copper, tin, lead, and aluminum, can be used satisfactorily with Freon compounds under normal conditions of use. At high temperatures some of the metals may act as catalysts for the breakdown of the compound. The above order is only approximate. Exceptions may be found with individual Freon compounds or for special conditions of use. Magnesium alloys and aluminum containing more than 2 percent magnesium are not recommended for use in systems containing Freon compounds if water may be present. Zinc is not recommended for use with Freon 113. Experience with zinc and other Freon compounds has been limited, and no unusual reactivity has been observed. However, it is more chemically reactive than other common construction metals, so it would seem wise to avoid its use with the Freon compounds unless adequate testing is carried out. Some metals may be questionable for use in applications requiring contact with Freon compounds for long periods of time or unusual conditions of exposure. These metals, however, can be cleaned safely with Freon solvents. Cleaning applications are usually for short exposures at moderate temperatures. Most halocarbons may react violently with highly reactive materials, such as sodium, potassium, and barium in their free metallic form. Materials become more reactive when finely ground or powdered. In this state, magnesium and aluminum may react with fluorocarbons, especially at higher temperatures. Highly reactive materials should not be brought into contact with fluorocarbons until a careful study is made and appropriate safety precautions are taken. If the space served by a conditioning unit operates on a regular schedule, a timeclock or setback thermostat is usually the best method of automatically starting and stopping conditioning. For greater control flexibility, you can combine timeclocks and setback thermostats with controls that respond to other conditions, such as outdoor temperature, occupancy, etc. Timeclocks and setback thermostats are not appropriate for spaces that operate on irregular schedules, such as conference rooms, auditoriums, and surgical suites. Unfortunately, facility managers sometimes try to schedule specific times for conditioning such spaces, most commonly through an energ management system. This inevitably leads to dissatisfaction. Don’t use temperature setback if the thermostatic control system would use energy to force the setback temperature. This limitation exists in units that provide both heating and cooling, where neither can be turned off. For example, four-pipe fan-coil units with pneumatic controls are sometimes installed with a single thermostatic element controlling both the heating and cooling coils. These are installed in some luxury hotels so that guests do not have to select heating or cooling. If a setback thermostat were used with this type of system, switching to the lower nighttime temperature would consume energy to cool the space to the nighttime temperature, and to maintain that temperature until the setback thermostat switched back to the daytime temperature. If the conditioning unit uses reheat, study the unit’s controls before using temperature setback. Setback while reheating actually increases energy consumption. (Reheat is rarely used in room conditioning units. When it is used, the purpose is usually to control humidity. In most cases, but not in all, a setback thermostat is preferable to a timeclock. Setback thermostats behave in the same way as timeclocks, until the temperature falls (or rises) to the temperature limit that is set. The main advantage of a setback thermostat is that it restarts the conditioning unit if the temperature drops to the lower setting. as a safety feature to protect against excessively low (or high) temperature. If the conditioning unit has a continuously running fan, using a timeclock to control the power to the unit saves fan energy, whereas a setback thermostat allows the fan to keep running. In some cases, it is fairly easy to install a setback thermostat so that it controls the operation of the entire unit. Setback thermostats cost more than timeclocks, but the labor cost of installing a setback thermostat in the thermostat circuit usually is less than the cost of installing a timeclock in the main power circuit. On the other hand, you could install a timeclock in the thermostat circuit. Another group of systems, air-and-water systems, provide all the primary ventilation air from a central system, but local units provide additional conditioning. The primary ventilation system also provides most, or all, of the humidity control by conditioning the ventilation air. The local units are usually supplied with hot or chilled water. These systems are particularly effective in perimeter spaces, where high heating and cooling loads occur. For example, in cold climates substantial heating is often required at the perimeter walls. In this situation, a hot-water-heating system can be installed around the perimeter of the building while a central air system provides cooling and ventilation. When the ventilation is provided through natural ventilation, by opening windows, or other means, there is no need to duct ventilation air to the zones from a central plant. This allows all processes other than ventilation to be provided by local equipment supplied with hot and chilled water from a central plant. The largest group of all-water systems are heating systems. The detailed design of these heating systems is covered in the ASHRAE course Fundamentals of Heating Systems. The airways of the respiratory system have developed an elaborate system of defences which trap all but the smallest dust particles. This system consists of hairs in the nose and mucus in the trachea or bronchi. The mucus is produced continuously by special cells in the walls of the larger airways. It is moved upward and to the back of the throat by the whipping action of cilia—tiny, hair-like projections on the cells of the trachea and bronchi. Large dust particles are trapped in the mucus and are either swallowed or spit out. Particles smaller than 0.5 microns (1 inch has 25,400 microns) may remain airborne and are exhaled. The most dangerous size of dust particles is 0.5-7.0 microns. Much too small to be seen with the naked eye, they can evade the defence system and reach the lungs. Once in the lungs, these tiny particles of dust may cause extensive scarring of the delicate air sacs. This scarring starts the disease process which produces severe shortness of breath. Most dust particles are too large to pass through the walls of the alveoli, but gases, vapours, mists, and fumes can all enter the bloodstream through the lungs. In addition, welding fumes or truck exhausts can stimulate the lung’s defences to produce large amounts of phlegm, causing the condition known as chronic bronchitis. These same substances can destroy the delicate air sacs of the lungs, causing emphysema. Because the lungs are in such intimate contact with so many pollutants in workplace air, they are the prime target for occupational carcinogens. In addition to the legal responsibilities on management, there are many specifi c responsibilities imposed by each organization’s health and safety policy. The responsibilities cover directors, senior managers, site managers, department managers, supervisors and employees. Many organizations will not fi t this exact structure but most will have those who direct, those who manage or supervise and those who have no line responsibility but have responsibilities to themselves and fellow workers. Because of the special role and importance of directors, these are covered here in detail. Health and safety is a boardroom issue. Good health and safety refl ects strong leadership from the top and that is what we want to see. The company whose chairperson or chief executive is the champion of health and safety sends the kind of message which delivers good performance on the ground. Those who are at the top have a key role to play, which is why boards are being asked to nominate one of their members to be a ‘health and safety’ director. But appointing a health and safety director or department does not absolve the Board from its collective responsibility to lead and oversee health and safety management. ➤ the Board needs to ensure that it is kept informed of, and alert to, relevant health and safety risk management issues. The Health and Safety Commission recommends that boards appoint one of their number to be the ‘Health and Safety Director’. ➤ ensure that regular audits are carried out to check that effective health and safety risk management systems are in place. By appointing a ‘Health and Safety Director’ there will be a board member who can ensure that these health and safety risk management issues are properly addressed, both by the Board and more widely throughout the organization. The Chairman and/or Chief Executive have a critical role to play in ensuring risks are properly managed and that the Health and Safety Director has the necessary competence, resources and support of other board members to carry out their functions. Indeed, some boards may prefer to see all the health and safety functions assigned to their Chairman and/or Chief Executive. As long as there is clarity about the health and safety responsibilities and functions, and the Board properly addresses the issues, this is acceptable. The health and safety responsibilities of all board members should be clearly articulated in the organization’s statement of health and safety policy and arrangements. It is important that the role of the Health and Safety Director should not detract either from the responsibilities of other directors for specifi c areas of health and safety risk management or from the health and safety responsibilities of the Board as a whole. What Are The Effect Of Environment On Work Safety? The environment has a significant part to play in the capacity of the person–machine combination to produce output at the desired level and without loss. The person–machine production and safety factors are reduced by downgrading the work environment. • emotional stresses: fear, anxiety, boredom or personal issues. Generally, a machine is not designed to operate continuously at its maximum limit. Logically, we should not design work systems which demand constant maximum output and vigilance from humans. Both people and machines are less prone to error where environmental variations and extremes can be avoided. Also to be avoided is the belief that, because person and machine are seen to perform well in poor environmental conditions, improvement is not needed. The effectiveness of procedures in ensuring suitable practices depends on training, supervision and the culture of the organization. What Are The Different Types Of Workplace Injuries? or a view of the duration based on the nature of injury. Other duration sheets relating to bodily location, mechanism of injury and breakdown agency (e.g. tool, substance) are also available. Class 1 Accident permanently alters the future of the individual. Class 2 Lost-time accident where individual fully recovers. Class 3 Accidents which cause inconvenience to the individual but do not stop him/her from carrying out normal duties. McDonald has produced line diagrams which graph class of injury and total cost of that class based on actual data for an OHS jurisdiction. The case for focusing prevention on Class 1 is very strong. This rate is often referred to as the Duration Rate, and is used to indicate the severity of injury. As we saw hen discussing the Frequency Rate, we were unable to determine how serious the LTIs were because this data was not built into the formula. By using the ATLR in combination with the Frequency Rate a clearer picture of injury performance is possible. The ATLR is calculated by dividing the number of days lost through injury by the number of LTIs. A death is counted as 220 standard working days lost. As a result of this calculation we are now in a better position to assess the injury performance. We now know the organization has had 40 LTIs per million hours exposure and each injury experienced during the year resulted in an average of 15 days off work. This additional information provides the safety and health professional with the necessary knowledge required to make decisions and recommendations on the areas of risk within the workplace where resources and effort should be directed. The main thrust of this model is in the category of operator behaviour. It is based on Rasmussen’s theoretical work on the analysis of operator tasks. According to his model, three levels of operator behaviour may be identified. This refers to routine tasks requiring little or no conscious attention during task execution. In this way enough ‘mental capacity’ is left to perform other tasks in parallel. For example: an experienced car driver travelling a familiar route will control the vehicle on a skill-based level, enabling them to have an intelligent discussion with a passenger, parallel to the driving task. This refers to familiar procedures applied to frequent decision-making situations. A car driver integrating the known rules for right-of-way at crossings with stop signs or traffic lights, deciding whether to stop the vehicle or pass the crossing, is functioning at this level also. The separate actions themselves (looking for other traffic, bringing the vehicle to a full stop, changing gears, etc.) will again be performed on a skill-based level. Making these familiar decisions and monitoring the execution of the skill-based actions requires some part of the total mental capacity available to the driver, but not all. This refers to problem-solving activities, for instance when a person is confronted with new situations for which no readily available standard solutions exist. The same car driver approaching a crossing where the traffic lights have broken down during rush hour will first have to set their primary goal: do they want to proceed as fast as possible or do they want to minimize the chance of collision? Depending on this goal they will control the vehicle with varying degrees of risk taking (e.g. by ignoring some of the usual traffic rules whenever they see an opportunity to move ahead somewhat). It is interesting to note that this model infers that an accident occurs as a consequence of goal setting followed by a human decision. Any error may be attributed to human behaviour, perception, cognitive skills and experience, factors which have been widely used in other accident models. Rasmussen has also developed the boundary theory which has particular relevance to large-scale acccidents. In this theory organizations operate in a space of possibilities within the three boundaries of economic failure, unacceptable workload and functionally acceptable performance. Within this last boundary is the resulting perceived boundary of acceptable performance. The distance between these two is the margin for error. Rasmussen considers experiments to improve performance to create Brownian or random movements within this space. There are pressure gradients operating, such as the gradient towards least effort, and the management pressure towards efficiency, both driving the organization in the direction of the perceived boundary of acceptable performance. A counter gradient may exist in the form of safety culture campaigns. If corporate behaviour in the presence of strong gradients migrates past the perceived boundary and reaches the boundary of functionally acceptable performance, then an accident is likely.